This post first appeared on the blog of the Political Studies Association Specialist Group on Parliaments. It is based on my paper presented at the group’s Legislatures in Uncertain Times conference, held at the Scottish Parliament in November 2017. The Intelligence and Security Committee (ISC) was established in 1994 to provide, for the first time, oversight by parliamentarians of the British intelligence and security agencies. Although modelled on the select committees, the ISC was not established a parliamentary committee, but was appointed by, and reported to, the Prime Minister. Reforms included in the Justice and Security Act 2013, reconstituted the ISC as a parliamentary committee, and provided it with a new and expanded mandate. Despite these changes, this post argues that in a number of respects the ISC has become less visible in recent years and is increasingly marginalised by government, leading to potential gaps in the democratic accountability of intelligence in the UK. Two general elections in quick succession have had a significant impact on the work of the Intelligence and Security Committee as they have on many parliamentary committees, although the impact on the ISC has perhaps been more acute. The ISC is reconstituted following each general election. Following changes introduced in 2013, members of the ISC are nominated by the Prime Minister after consultation with opposition leaders, and the committee is then appointed by the House of Commons Selection Committee. For reasons that are not clear, this process took a very long time following the 2015 general election and even longer in 2017. These delays have significantly disrupted the work of the ISC, which has a considerable backlog of work. 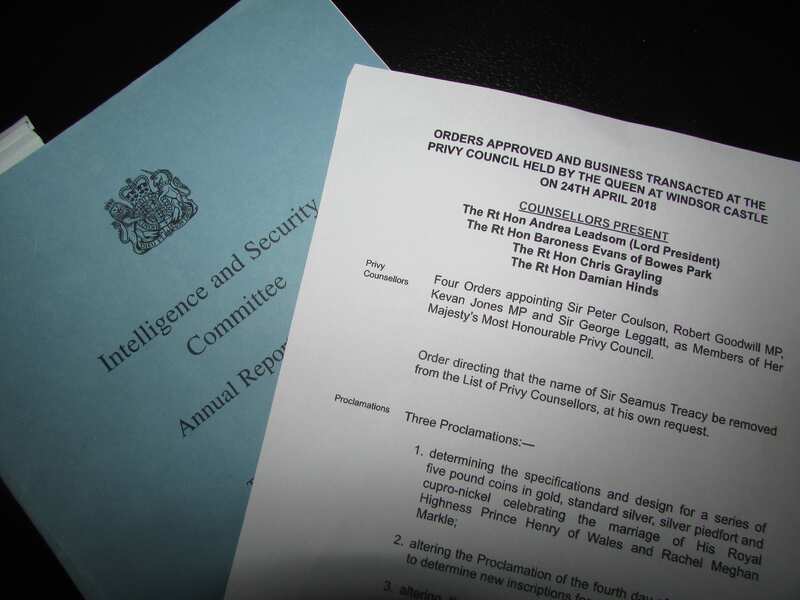 The ISC inherited the detainee inquiry when the judge-led inquiry into the treatment of prisoners by UK intelligence personnel was wound up in 2013, but it has yet to report.Further, while the ISC has a statutory duty to produce an annual report on its work, there was no annual report for 2014 – 2015, the first time this has happened, and the most recent annual report covering 2016 – 2017, which was due to be published in the spring, was delayed by the general election. Prior to the 2017 election the committee rushed out its report on the UK involvement in lethal drone strikes in Syria. However, in order to facilitate this, the committee decided to forego the usual process of negotiating with the government over the publication of sensitive material, with the result that the published report was much more heavily redacted than is usually the case. The newly established ISC announced an ambitious programme for the publication of its outstanding reports, and published the 2016 – 2017 annual report just before Christmas. The, as yet unfinished, detainee inquiry is expected to appear in 2018, along with a review of diversity and inclusion in the intelligence agencies. It is deeply unsatisfactory that for almost twelve months in the last three years, Britain has been without a legislative intelligence oversight body. There were four terrorist attacks in the period following the committee’s last meeting in the 2015-2017 Parliament. While it is not the role of the ISC to provide day to day scrutiny of the intelligence and security agencies, it does have a an expansive mandate which includes the scrutiny of operations and the handling of intelligence by government. The ISC has taken a close interest in the agencies’ performance against domestic terrorism, undertaking inquiries on the 7/7 bombing, the Crevice plot, and the murder of Fusilier Lee Rigby, and it will want to look at the handling of intelligence prior to the Manchester bombing and the London attacks. In terms of providing accountability and also reassurance, both to parliament and the public, it is important that the ISC exists and that it is active. General elections, while inconvenient, are a normal and essential part of the democratic process. However, the delay in establishing a new committee reflects a more worrying decline in the visibility of the ISC in recent years. The ISC is, of necessity, a secret committee, it meets behind closed doors, takes evidence in secret and its reports are subject to a process of review before publication. The fact that the ISC ‘operates within the ring of secrecy’, has often been considered to be one of the strengths of the committee. Under Rifkind, the committee held its first public evidence sessions, publicly cross-examining intelligence agency heads in November 2013. This was followed by the committee’s first public call for evidence as part of its Privacy and Security inquiry and a further series of public evidence sessions with academics, privacy campaigners and Government Ministers. Rifkind and his successor, Dominic Grieve, have also been somewhat more prominent than previous ISC chairs, in terms of speaking about the committee’s work and issuing public statements in response to emerging stories or public concerns, such as the Snowden revelations. Despite these developments the ISC has, in some respects, become less visible in recent years. The annual parliamentary debates on the work of the committee have fallen into abeyance. There has not been a House of Commons debate on the ISC since 2011, while there have only been two annual debates in the House of Lords, the most recent in 2010. The practice of holding evidence sessions in public has also not been repeated since 2014, with no public sessions in the last, albeit truncated, parliament. Given the nature of its work, public sessions are always likely to be a minor part of the ISC’s evidence gathering procedures. Nevertheless, a public call for evidence as part of the committee’s detainee inquiry has not been followed by further public evidence sessions, and written submissions have not been published. There was also clearly scope to hold public sessions with the agencies as part of the committee’s inquiry into women in the intelligence community, which focused on issues such as childcare, flexible working and maternity provision, and resulted in a report which, unusually, had no redactions. The scale of the ISC’s published output has also declined. The published output of the ISC has always been relatively modest, particularly compared to other parliamentary committees. In the 2010 – 2015 parliament, for example, the ISC published four annual reports and five additional reports, while in the same period, the Foreign Affairs Select Committee published thirty-five reports. Despite this the committee has reduced its reporting in recent years. Following the 2013 reforms a decision was made within the committee to reduce the length of its annual reports in order to allow a greater focus on the committees more substantive inquiries. The first two annual reports in the 2010 parliament were very long at 282 and 250 paragraphs, while the second two ran to just 52 and 17 paragraphs. In the same period the committee produced substantive reports on the murder of Fusilier Lee Rigby (191 paragraphs), and privacy and security (149 paragraphs). However, in the 2015 Parliament the ISC produced only three reports in total, all of which were very short when compared to the committee’s previous output: one annual report (20 paragraphs) and two special reports, on the Investigatory Powers Bill (13 paragraphs) and the UK’s involvement in lethal drone strikes (31 paragraphs). While it is perhaps a little unfair to focus solely on the length of the ISC’s output, as the committee meets and takes evidence almost entirely in secret, and its work is no longer debated in Parliament, its published output represents the only opportunity to scrutinise its work. One possible explanation for the ISC’s declining output is that the committee is simply overwhelmed by the burden of taking on the detainee inquiry. The ISC has been provided with extra resources to progress the inquiry, but it is a significant undertaking, involving the review of over 40,000 documents and over 60 hours of oral evidence. This is an important and long overdue inquiry which was begun in 2010, and about which the then Prime Minister, David Cameron, expressed the hope that it would ‘report within a year’. However, it would be unfortunate if the inheritance of this inquiry by the ISC was preventing the committee from carrying out its core functions and pursuing its own agenda. Finally, and perhaps most worryingly, there is some evidence that the ISC is becoming marginalised by the government. The delay in appointing a new committee clearly suggests that the establishment of the ISC is not a priority for the Government. The Government also appears to have ended the practice of publishing a response to all ISC reports. Moreover, there were some worrying signs at the end of the last Parliament that the government is pushing back against the new powers acquired by the committee in 2013. Oversight and scrutiny depend on primary evidence: without sight of the actual documents provided to Ministers we cannot ourselves be sure – nor offer an assurance to Parliament or the public – that we have indeed been given the full facts surrounding the authorisation process for the lethal strike against Reyaad Khan. It may be premature to conclude that, despite recent changes to its status and powers, the ISC is a committee in decline. Nevertheless, the committee is clearly facing a number of significant challenges in terms of establishing its authority and credibility. This may be a natural consequence of a committee testing the limits of its new mandate, although some of the issues identified here pre-date the 2013 reforms. It may also be a consequence of the ISC becoming a committee of Parliament, rather than one operating under the authority of the Prime Minister. Although these issues also clearly illustrate the extent to which the committee remains dependent on cooperation from the Government both for its existence and operation. It is to be hoped that a new committee is able to reassert the importance of effective parliamentary oversight of intelligence and arrest these worrying signs of decline. This post first appeared on the Democratic Audit blog in September 2017. The recent botched terrorist attack on a London tube train, following this summer’s attacks at London Bridge, Finsbury Park, and Manchester, have served to highlight the fact that the parliamentary committee tasked with overseeing the work of the intelligence and security agencies does not at present exist. The Parliamentary Intelligence and Security Committee (ISC) was wound up at the end of April in advance of June’s general election, but has not yet been reappointed. The onset of the party conference season means that the committee is unlikely to begin work before mid-October, more than five months since it last met. The committee has a significant backlog of work including the unfinished detainee inquiry which the committee inherited when the judge-led inquiry, announced by David Cameron in 2010, was wound up in December 2013. The committee’s annual report for 2016-17 was also delayed by the election. Grieve made clear that during the dissolution the committee’s staff would remain in place and seek to ‘progress the work’ on the detainee inquiry in preparation for the new committee. However, they will not be in a position to undertake any new inquiries. When it is finally appointed, the ISC is likely to play a significant part in examining the role of intelligence in responding to the recent attacks. Following reforms in 2013, the ISC has a new and expansive mandate which encompasses operational aspects of the work of the intelligence and security agencies, and also the broader management of intelligence within Whitehall. One possible explanation is that government and opposition leaders have been unable to agree on who should be nominated to serve on the ISC. Under reforms introduced in 2013, like other parliamentary committees, the ISC is now appointed by Parliament. However, because of the sensitive nature of its work the Executive still retains some control over membership and potential members must first be nominated by the Prime Minister after consultation with Opposition leaders. It has been suggested that the Labour leader, Jeremy Corbyn may have proposed members who are not considered suitable to serve on a committee with such a sensitive mandate. Although ISC members are notified under the Official Secrets Act, there has been a tendency to appoint MPs with previous Ministerial experience of working with the intelligence agencies, and who are considered reliable. One previous Labour Chair of the ISC argued that making the ISC a committee of Parliament would result in ‘nutters’ being elected to the serve on the committee. The current delays may well be the result of the scenario that, Kim Howells, so inelegantly envisaged. A more prosaic, and more likely, explanation for the delay in appointing a new ISC is that it has become entangled in parliamentary procedure and delayed by wider concerns about the government’s legislative agenda. The ISC is not the only parliamentary committee which has taken a long time to get up and running. The appointment of House of Commons select committees is now a lengthy two-stage process in which Chairs are elected by the whole House, and ordinary members by their respective parties. Although the election of Chairs took place in July, before the summer recess, the membership of the select committees was not confirmed until early September. The ISC is a statutory committee of parliament and not a select committee, however, its creation is closely bound up with the process for establishing select committees. As noted above the procedure for nominating ISC members is different to that for select committees and is designed to allow the Executive to retain some control over membership. However, once members have been nominated by the Prime Minister, under Standing Order 152E of the House of Commons, the creation of the ISC is then handled by the Committee of Selection, which tables a motion on the floor of the House proposing the membership. Unlike the ISC, the Committee of Selection is a select committee, which means that it must be in place before the ISC membership can be confirmed. Any delay in establishing the select committees, and the Committee of Selection in particular, therefore has an impact on the ISC. Although the Committee of Selection is now in place it was only established on 12th September, just before Parliament went into recess for the party conference season. Whatever the reason for the delay, and it may well be a combination of the above, for the second time in two years Britain has been left without a parliamentary intelligence oversight committee for a prolonged period, and moreover, a period in which Britain’s intelligence and security agencies are facing significant challenges. As Dominic Grieve made clear in April, this is not in the public interest. A solution to this procedural delay must be found if the ISC is not to become a second-tier committee with little impact or importance. Interestingly in Canada, which has recently created a parliamentary intelligence oversight committee modelled on the British ISC, legislation states that the committee must be in place within 60 days of Parliament returning after a general election. No such condition exists in the legislation relating to the ISC, but neither does it set out the current procedure for the appointment of the ISC by the Committee of Selection and after the establishment of select committees. There is scope for adopting a different mechanism for appointing the ISC. Serious consideration must surely now be given to finding a different and more timely mechanism for establishing this important committee. This post first appeared on the RUSI blog in May 2017. The announcement of a snap general election and the rapid conclusion of the shortest Parliament for more than 40 years have undoubtedly placed considerable strain on Westminster. Legislation has been rushed through or abandoned, while parliamentary committees have rapidly sought to conclude inquiries and publish reports. The Intelligence and Security Committee (ISC) is just one of many parliamentary committees caught out by the timing of Britain’s early general election, but the impact on this committee is particularly acute. The ISC was the last parliamentary committee to be appointed following the 2015 general election, more than four months after the vote – and long after the appointment of select committees – and inherited a significant backlog of work. The 8 June election has prompted the premature publication of its drone strikes report, while others have inevitably been delayed and another turnover in membership will further undermine the committee’s expertise. The delay in appointing the committee after the last general election was compounded by the fact that the previous committee had effectively stopped work in February 2015, when the Chair, Sir Malcolm Rifkind, resigned. The ISC declined to elect a replacement and the committee effectively went into desuetude more than two months prior to the 2015 general election. Even if a new committee is promptly appointed after 8 June, it remains the case that since the beginning of 2015, the UK has been without a legislative intelligence oversight committee for a total of more than nine months. … all political parties to prioritise the appointment of members to the Intelligence and Security Committee following the General Election: it is not in the public interest for oversight of the intelligence community to be left unattended for any period of time. The 2015 general election also saw a large turnover of membership of the ISC. The committee is reconstituted after each general election, usually with a combination of new and experienced members, but the committee appointed in 2015 was the most inexperienced since the ISC was first established in 1994. While four members were retained, only two of those had served for the whole of the previous parliament. Moreover, two committee members have stepped down since the 2015 general election, including the longest serving committee member, George Howarth. Two further members, Fiona Mactaggart and Gisela Stuart, are not standing in the general election with the result that even if all the remaining members are reappointed after the general election, only one, Lord Lothian, will have more than two years’ experience on the committee. The turnover in membership and the speed with which a new committee is appointed are important for a number of reasons. As the committee has itself observed, intelligence is an area in which few parliamentarians have much experience and membership of the ISC comes with a steep learning curve. The relative inexperience of committee members may be compounded by the need to hit the ground running. Britain is still facing a significant terrorist threat and delays in making appointments to the ISC have, in the past, left the committee struggling to keep up with events. Most notably, this happened following the 2005 general election when a new committee was not appointed until the 12 July, several days after the 7/7 terrorist attacks in London. The committee appointed in 2015 also inherited a significant backlog of work that has inevitably been disrupted by the early election. The ISC was asked by the prime minister to pick up the work of the unfinished detainee inquiry when the judge-led inquiry was wound up in December 2013. The ISC was provided with extra staff to enable it to analyse the 40,000 highly classified documents received by the inquiry, and has taken additional evidence from the intelligence agencies and former government ministers, but has yet to report on the issue. In its latest annual report, published in July 2016, the committee reported that, although this was now their priority, the inquiry was still ‘expected to occupy the Committee for some time’. Significantly, the committee has asserted that its staff will continue to work on the inquiry even while parliament is prorogued, so they can ‘progress the work … in readiness for the new Committee’. Another focus for the ISC since 2015 has been its inquiry into the use of intelligence in targeted drone strikes against UK nationals in Syria. ISC reports are submitted first to the prime minister and reviewed by the agencies concerned before publication. Suggestions for the redaction of sensitive material are then subject to a process of negotiation between the committee and the government. Although the ISC submitted its report to the prime minister in December 2016, it did not receive a draft of the report with suggested redactions until 12 April, only days before Theresa May’s announcement of her intention to call an early general election. In a highly unusual move, in order to facilitate the publication of the report before the election, the committee decided to forego the usual process of negotiation and published the report with all of the government’s suggested redactions. In a robust press release to accompany the publication, the committee made clear that the report was being published ‘even if it was more heavily redacted than we would normally accept’ and that the redactions ‘are therefore precisely those as proposed by the Agencies and Departments on behalf of the Prime Minister’. The early election also means that the government’s customary response to the drone strikes report will not be published until after the election. The government has yet to respond to the committee’s annual report for 2015–16 and the ISC has also revealed that although its annual report for 2016–17 is complete, it too will not be published until after the election. This catalogue of delays and interruptions is an unwelcome consequence of an early general election, which many would claim has been called in the interests of political expediency. It is to be hoped that the prompt reconstitution of the ISC after the election will serve to minimise the unwelcome impact this has had upon its work.